To foster more effective conservation, a team of experts has taken a new approach to looking at forest, river and wetland habitats on Long Island Sound. The team, which included CT Sea Grant’s Juliana Barrett, applied a quantitative landscape scale assessment to determine habitat condition. Through this critical lens specific goals can be set and progress tracked. The assessments are a means of making more effective conservation decisions, which is increasingly important amid growing concerns that habitat losses are outpacing gains made through restoration projects. 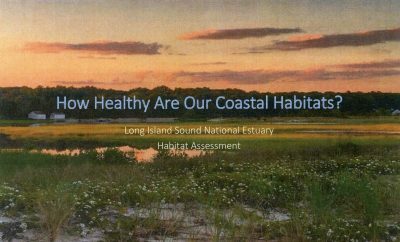 Their work is described in “Advancing Coastal Habitat Resiliency through Landscape-Scale Assessment,” published in the January 2018 issue of the Journal of Coastal Management. Co-authors with Barrett on the article are Georgia Basso of the U.S. Fish & Wildlife Service Coastal Program in Charlestown, R.I.; Jamie Vaudrey of the UConn Department of Marine Sciences; and Kevin O’Brien of the Land and Water Resources Division of the Connecticut Department of Energy and Environmental Protection.